It started for me with a letter from a Los Angeles filmmaker named Mike Williamson, who contacted me March 7 in outrage about a bait-and-switch involving IMAX. He paid an extra fee to see a movie in Burbank, and wrote the company in protest: "As soon as I walked in the theatre, I was disgusted. This was not an IMAX screen. Simply extending a traditional multiplex screen to touch the sides and floor does not constitute an IMAX experience. An IMAX screen is gargantuan. It is like looking at the side of a large building, and it runs vertically in a pronounced way. It is not a traditional movie screen shape....This screen was pathetic by IMAX standards." If you will click to enlarge the graphic below, you will see that Williamson has a point. The illustration comes from Jeff Leins of newsinfilm.com, based on one with a useful article by James Hyder, editor of the LFexaminer, devoted to this issue. But documentation isn't really necessary. Most of us know what an IMAX screen looks like, and we instinctively know one wouldn't fit inside our local multiplex. What "IMAX" means in such situations is that the company has taken over the largest screen in the complex, removed a few of the front rows of seats, and moved a somewhat larger screen that much closer to the audience. The picture is not projected through large format 70mm film, but with dual "high end" digital projectors. Every digital projector ever introduced was "high end" at the time. James Hyder makes bold to mention the elephant in the room: New Coke. That marketing fiasco gave financial meaning to the old saying, If it ain't broke, don't fix it. Twenty-four years after millions were spent to roll out New Coke, the multiplexes of the world sell Old Coke, Old Pepsi, and in India, the admirable Thums Up Cola. There is a lesson there somewhere. The lesson is, if you have advertised Kleenex, don't fill the box with paper towels. IMAX created a spectacular film format, and found universal customer satisfaction. I'll bet 98% of the people who experienced it loved it. In a piece written the other day by Patrick Goldstein for the LATimes, he wrote that when he interviewed IMAX CEO Richard Gelfond, the CEO "got right to the point. He continues to insist that Imax enjoys enormous customer satisfaction, backing up the claim with a market-research study that found that 98% of Imax moviegoers had enjoyed their experience at the new, medium-size theaters as much as at the older giant screens." Uh, huh. If I were Gelfond and market researchers gave me that result, I'd fire them. I certainly wouldn't be trusting enough to quote them. Executives need a seat-of-the pants instinct. 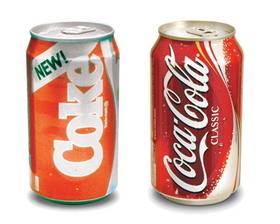 Coca-Cola's expensive surveys assured them that people preferred the taste of New Coke. The fact is, they didn't. Anyone reading this could have told them that for free. Yet Hyder quotes Gelfond: "we don't think of IMAX as the giant screen. Rather, it is the best immersive experience on the planet." His problem appears to be that most people do foolishly persist in thinking of IMAX as the giant screen. The "IMAX" version offered in multiplexes could be duplicated by any multiplex that was willing to sacrifice a few rows of seats and install the nice projectors. It's even possible that you could have an equivalent of the experience simply by taking a seat closer to the front. The obvious solution is to brand "new IMAX" so customers know what they're getting. Call it IMAX Lite, IMAX Junior, MiniMAX or IMAX 2.0. Or call the old format "IMAX Classic." Hey, that worked for Coke. Significantly, a lot of exhibitors favor specifically identifying the new format, perhaps because they're offering something better than on their other screens, yet getting flack from customers because it's inferior to IMAX Classic. One reason exhibitors are friendly to IMAX is that the company is spending money to convert the target theaters. The exhibitors themselves, however, are expected to pay for an upgrade to the latest 3-D technology. Everybody is short of money these days, and both formats offer an excuse for a $5 surcharge. The business model makes sense for IMAX because it plans to identify its trademark with "tentpole movies." You won't be seeing "Let the Right One In" anytime soon on their screens. They offer studios a bonus in terms of ticket pricing for giving them films like "The Dark Knight," "Iron Man," "Watchmen" and so on. Their opening weekend tentpole target customers, fanboys, don't mind the five bucks as much as a family with four kids. Theaters feel a sense of urgency because they're being squeezed by cable, view-on-demand, DVD, Blu-ray and other less expensive ways to see a movie. As analysts have observed time and again, when radio squeezed theaters, the response was talkies. When TV did, the response was a different viewing experience: Wide screen, original 3-D, and so on. The compromise today is, the industry is offering an ordinary good viewing experience as somehow a superior one. Why doesn't every screen offer a picture as good as IMAX? Will the customers in the other theaters in the same multiplex feel like second-class citizens? My guess is, they will not. If a film is properly projected and has good sound, it is as immersive in regular theaters as in upgraded ones. Immersion is an experience of the imagination, not the body. Besides, not everybody wants to have a head trip at the movies. Some people want to sit outside the film and simply look at the damned thing. My belief is that 3-D does not aid in immersion. As Goldstein writes, it "still largely looks like a marketing hustle designed to grab more dollars from gullible moviegoers." I've written a lot about 3-D, which has admittedly been effective if seen through advanced glasses on IMAX screens with films like "The Polar Express" and "Beowulf." On an ordinary screen with ordinary glasses, I recommend 2-D as superior. For most films, 3-D is an annoyance and a distraction. Yes, I'm told, but just you wait for James Cameron's "Avatar" to open this December. That film has been 10 years in the making at a reported cost of $300 million. I fully expect to be impressed. I doubt if the same effect can be achieved more quickly and cheaply, and by a director less immersed in technology than Cameron. The fact remains that most movies should look better than they do today, even at their best, if they're to compete with a family sitting happily at home in front of a big screen, watching Blu-ray. 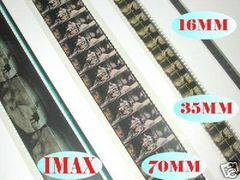 There is a mature format that can easily achieve that, called 70mm, but the industry is unwilling to spend the money. Is there no possibility of a breakthrough? It can project film at 48 frames per second, twice the existing 24-fps rate. That provides a picture of startling clarity. At 48 frames, it uses 50 percent more film than at present. But MV48 also has an "economy mode" that uses that offers low-budget filmmakers savings of up to 25 percent on film. The MV48 projector design can switch on the fly between 24- and 48-fps formats in the same movie, allowing extra clarity for scenes that can use it. And it can handle any existing 35mm film format - unlike digital projection, which would obsolete a century of old prints. MV48 uses a new system to pull the film past the projector bulb without any jitter or bounce. Goodhill explained that MV48 completely eliminates the jiggle that all current films experience as they dance past the projector bulb. Watching it, I was startled to see how rock solid the picture was, and how that added to clarity. The result: "We figure it's 500 percent better than existing film." It is also a lot cheaper, because it retrofits existing projectors, uses the original lamp housings and doesn't involve installing high-tech computer equipment. MaxiVision's business plan [at that time] calls for leasing the projectors at $280 a month, but if you wanted to buy one, it would cost you about $10,000. Estimates for high-end digital projectors range from $110,000 to $150,000 per screen. So what's the problem? Frankly, I think the problem is that many studio executives are focused on their own survival and their current grosses much more than emerging technologies. They're mesmerized by the word digital and hope that by pouring money into digital technology they'll cover their bases. Digital is the safe and obvious choice. Not Maxivision, which costs a fraction as much, is many times superior, uses existing projectors and proven technology, is backward compatible with the film heritage, and in Econo-Mode would reduce the film footage needed for an ordinary movie. I've been saying that for years. I'll keep on saying it. Sooner or later, someone will listen. 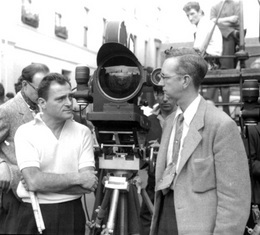 Holllywood must still have a few visionaries like Mike Todd and Douglas Trumbull. The case for Maxivision is too compelling. I remember something Goodhill once told me in an e-mail: "I'll make a special offer. We're leasing MV48 for $280 a month, but for $2,800 a month, we'll throw in a little chrome plate that says 'digital' on it." Trailer: "House of Wax" in the "Third Dimension"
Mike Todd appears on "What's My Line?"